Today I went running for the first time since I finished the fleche. I wanted to give my knees a couple of days to stop feeling wonky. You’re welcome, knees. My weekday route is a fun three-mile stretch that takes me from the foot of the U.S. Capitol to the World War II Memorial and back. I pass the National Gallery of Art, the Air and Space Museum, the Museum of Natural History, and eventually I loop around the Washington Monument. Summer-like sun shone down on the Mall this afternoon. I loped along into the headwind and twisted through tourists, cocooning myself with my headphones and a rockin’ playlist. My bare legs and arms soaked in the glorious warmth of the crystal clear day and my feet scurried along the loose gravel surface of the path, weaving when necessary to avoid tourists and keep a steady pace. I circled my way past the Washington Monument for the second time. 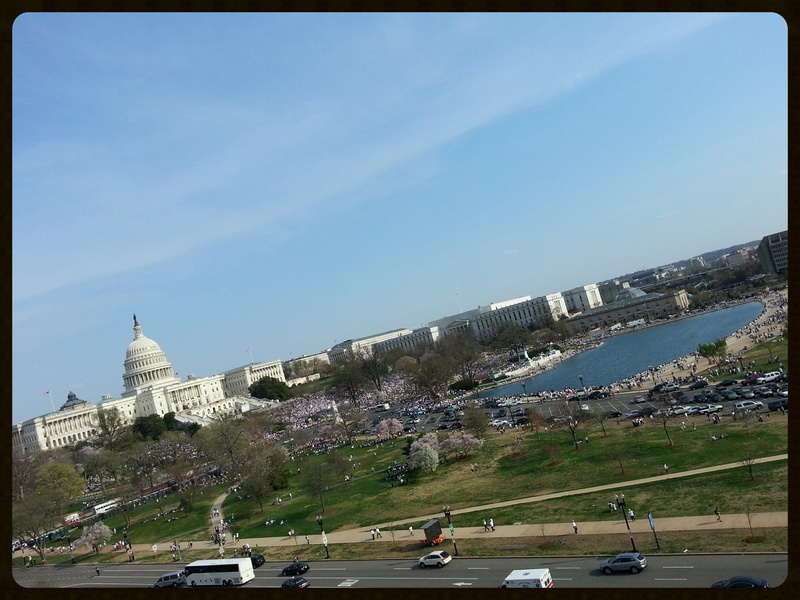 I was briefly caught up in a throng of cherry blossom admirers, but soon broke free of their crush as they meandered toward the Tidal Basin. I felt the wind at my back, my feet quickened, and Usher’s “Numb” started playing in my ears. I experienced an intense awareness of my legs’ movements as they pumped up, out, and down in time with the music. I have no idea what that the lyrics to that Usher song mean, but it has a great beat for running and despite its title to the contrary, to me it said, in this moment you are completely free and alive. Running is like no other activity. Completely unassisted as I move forward, the impact of my feet as they hit the ground and push away constantly drives home my effort. No coasting. Unlike riding a bike, there is minimal gear. Running shoes. That’s it. I often drill out my three-mile loop without much thought. It’s an appointment on my calendar sandwiched in between other appointments and obligations. Today was different. Every fiber in me filled with the exhilaration of being outdoors. I was gangly and full of life, grateful to have enjoyed a brief spate in the open air. Completely free. I confess to running the Fort Adams 7 Mile Road Race in Newport RI with the Squeeze song Farfisa Beat stuck in my head. It took my mind of the incessant rollers. I love it when a good song gets into your head. It can really be a mental lift!